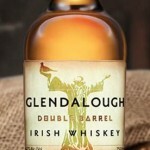 Irish craft distiller Glendalough has added a new whiskey to its range, the single grain Double Barrel. The whiskey is distilled from a mash of malted barley and corn using Glendalough’s traditional Coffey still, then matured for three and a half years in first-fill ex-Bourbon barrels. The final step is an additional six months of maturation in Oloroso Sherry casks. Double Barrel is bottled at 42% ABV, and will initially be available in Ireland for around €35 ($40 USD). It is believed to be the first whiskey release from Glendalough distilled at the Wicklow-area distillery, which has released 7 and 13-year-0ld Irish single malts sourced from other distilleries in addition to its own poitins and gins.